NEON has landed North American rights to Tim Wardle’s stranger-than-fiction documentary, THREE IDENTICAL STRANGERS, which premiered Friday at the 2018 Sundance Film Festival to both audience and critical acclaim. CNN Films will have U.S. broadcast distribution rights. 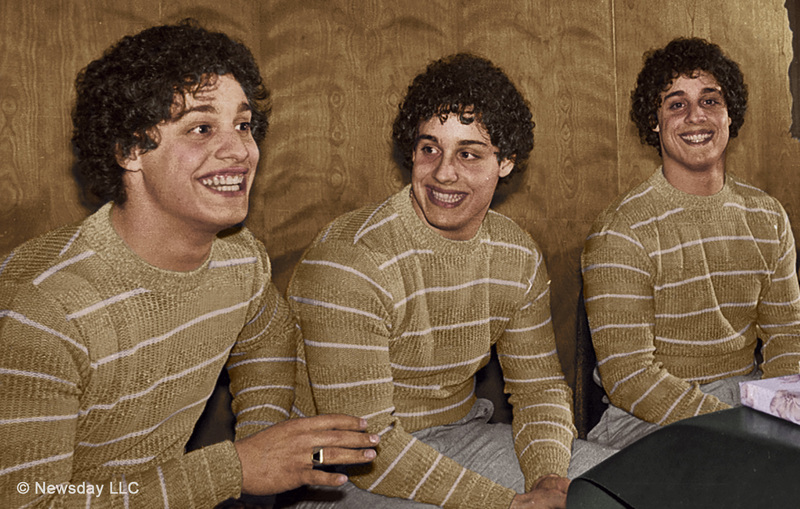 THREE IDENTICAL STRANGERS is the incredible true story of how three complete strangers make the astounding discovery at age 19 that they are identical triplets separated at birth. This multi-layered, gripping, conspiracy thriller begins with the trio’s joyous reunion in 1980 which catapults them to fame but also sets in motion a chain of events that unearths an extraordinary and disturbing secret that goes far beyond their own lives – a secret that might one day answer a key question at the heart of human behavior. The film is directed by Tim Wardle, of the U.K.-based RAW. RAW’s Becky Read and Grace Hughes-Hallett produced along with CNN Films in association with Channel 4. Dimitri Doganis, Amy Entelis, Courtney Sexton, Sara Ramsden, Adam Hawkins and Tom Barry executive produced. The deal announced today was negotiated with NEON by Josh Braun of Submarine and Stacey Wolf, vice president of business affairs for CNN Worldwide, along with Matt Burke and Ben Braun of Submarine and Kelly MacLanahan, senior counsel, CNN Worldwide on behalf of CNN Films. Co-founded by Tom Quinn and Tim League, NEON’S debut film was Nacho Vigalondo’s Colossal, starring Anne Hathaway and Jason Sudeikis in April of 2016. In its inaugural year, NEON released Academy Award winning director, Laura Poitras’s Risk, Ana Lily Amirpour’s The Bad Batchand Errol Morris’, The B-Side, Matt Spicer’s Ingrid Goes West, Eliza Hittman’s BEACH RATS and Craig Gillespie’s I, TONYA. They’ve acquired the French language Belgian thriller, Racer and the Jailbird, SXSW audience sensation, Aaron Katz’s Gemini, Harmony Korine’s The Beach Bum and the 2017 Toronto International Film Festival opening night film by Janus Metz, Borg vs McEnroe. NEON’S latest acquisition in partnership with 30WEST, Craig Gillespie’s, I, Tonya, stars Margot Robbie, Allison Janney and Sebastian Stan. In a span of 6 months from its purchase, I, Tonya opened in December to the one of the highest per screen averages of the year, garnered two Critics Choice Awards for Allison Janney and Margot Robbie, three Golden Globes nominations including one win, received two SAG nominations including one win, a WGA nomination, and most recently three Academy Award nominations. To date, the film has grossed over $15mm. NEON and 30WEST recently announced a partnership with 30WEST making a majority investment in the film studio. NEON’S latest acquisitions out of Sundance are Reinaldo Marcus Green’s Monsters and Men, Sam Levinson’s, Assassination Nation and Coralie Fargeat’s, Revenge. Raw is an award-winning London-based film and television production company producing high-end scripted and unscripted projects for broadcasters worldwide, alongside a substantial feature film slate. Founded in 2001 by Dimitri Doganis and now owned by ALL3 Media, Raw’s senior management team also includes Creative Director Bart Layton, CEO Joely Fether and Managing Director Piers Vellacott. Raw has enjoyed a string of successful series and one-offs in the UK and US originally in documentary and unscripted genres, including Bart Layton’s BAFTA-winning feature documentary The Imposter, Discovery’s top long-running series Gold Rush, eleven seasons of Locked Up Aboard (National Geographic Channel), and ratings hit Race for the White House (CNN). UK credits include the recent Chris Packham – Aspergers and Me (C4), BAFTA-winning Drug Trial (BBC), and feature documentary The Silk Road: Drugs, Death and the Dark Web. Raw moved into scripted production following the appointment of Katherine Butler to head the Scripted Film and Television Department in 2014. Scripted credits include the critically acclaimed Cyberbully (C4) in the UK, and the highly successful US mini-series Harley and the Davidsons (Discovery) with a large slate of TV projects to follow. Raw’s first narrative feature film directed by Bart Layton, American Animals, premiered in Sundance 2018 alongside Tim Wardle’s Three Identical Strangers. Raw currently has nine features in development, several moving towards production in 2018. CNN Films, in its fifth year, produces and acquires documentary feature and short films for theatrical and festival exhibition and distribution across CNN’s multiple platforms. Amy Entelis, executive vice president of talent and content development, oversees the strategy for CNN Films; Courtney Sexton, vice president for CNN Films, works day-to-day with filmmakers to oversee projects. For more information about CNN Films, please visit www.CNN.com/CNNFilms and follow @CNNFilms via Twitter.